The Office of Naval Research electromagnetic railgun industry prototype launcher is being evaluated at the Naval Surface Warfare Center, Dahlgren Division. General Atomics and BAE Systems have designed next-generation prototype electromagnetic railguns capable of increased firing rates. The railgun is a long-range weapon that launches projectiles using electricity instead of chemical propellants. 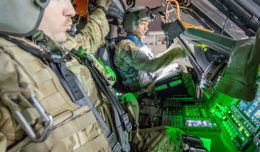 Now, four years after its creation in 2012 by then-Deputy Defense Secretary Ash Carter, the Strategic Capabilities Office, or SCO, is coming out of the shadows, publicly sharing its mission as a technology transformer and some of its successes — but not the best ones. The best projects remain classified, SCO Director Will Roper says, as a surprise for adversaries in the event of a conflict. During a recent media roundtable, Roper explained that the office’s small team of technical engineers, service members and other detailees take systems the Defense Department already has tremendous investments in and transform, or repurpose, them for use in ways the world has never seen, or countered. 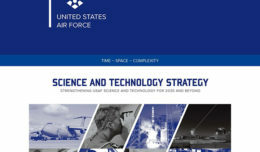 “SCO is just a piece of the third offset,” Roper said, referring to the name of the approach the department is taking to offset adversaries’ strengths by creating advanced leap-ahead technologies for use in a potential fight. “We’ve had three and half years now to work this problem and we selected the area of repurposing not based on fiscal requirements or because we were told go repurpose stuff, but we think it … is the right first disruptive move against opponents of the U.S.,” he said. “If [adversaries] think they’re going to deny all the systems that we’ve got two decades of investment in, we’re going to try to undercut that assumption and show them that it’s wrong,” he added. But Roper said SCO can’t make a move outside the portfolio of systems that exist in the department or in the commercial world, so SCO and the broader third offset context is a buying-time element. To do their work, SCO engineers take one of three approaches — they take something designed for one mission and make it do a completely different mission, or they integrated single systems into teams, or they change the game by adding in commercial technology. One of their successes is the Perdix project — micro-unmanned aerial vehicles created inexpensively on 3-D printers, with insides that are commercial components, and launched in balloons to swarm from an F-16 Fighting Falcon’s standard dispenser-sized flare cartridge. The micro-UAVs are built in a slightly more ruggedized way than off-the-shelf versions, Roper said. “It’s not big, it’s not heated, so we’re going to have to live at minus 40 degrees on the aircraft and there’s no power. So for us, the wide world of micro-UAVs necks down to a small box” that comes out of an F-16 at Mach 9, he said. The largest swarm so far was with 20 of the Perdix micro-UAVs at the 2015 Northern Edge Exercise in Alaska, he added. During Defense Secretary Ash Carter’s Feb. 2 speech at the Economic Club of Washington, where he previewed the fiscal year 2017 budget, he described another SCO project, this one taking systems designed for offensive missions and turning them into defensive systems, Roper explained. 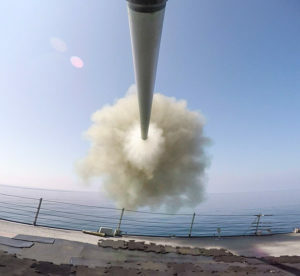 For this gun-based missile-defense project, SCO is using the hypervelocity smart projectiles developed for the future electromagnetic railgun in the Army’s 155-mm Paladin artillery system, Navy 5-inch guns and the 5-inch, .54-caliber Mark 45 artillery gun that’s on the front of destroyers. Carter noted that while testing the hypervelocity projectiles in a Paladin, they learned that the projectiles significantly increased the Paladin’s range. Applications for the technology, Roper said, include defending high-value small-area assets like foreign operating bases, ships and ports, but with high-density fire with assets that are completely mobile. “We’d like the opponents of the U.S. to think [that they] can’t saturate their defense just by having enough systems on [their] side. We’d like them to think that these critical forward operating bases and stations will continue to operate no matter how many missiles they continue to throw at them,” the director added. Another project focuses on creating an advanced navigation capability by using smart-phone-class cameras and other commercial systems on existing weapons like small-diameter bombs to augment targeting. Roper said the technology add-on is modular and kit-based, “so though we can strap it onto the same small-diameter bomb — ones that we’re using to do counter-ISIL to give them the ability to navigate without GPS — we can put the same kit on the small-diameter bomb II, the [joint direct-attack munition]” and others. Torpedoes are a capability the department has developed over many years, Roper said, and SCO is taking a look at the MK-48 heavy prototype torpedo. “As the Navy is looking to field a baseline capability or restart a baseline capability with that program, we’ve identified several technologies that have matured around the department that [bringing] them together we believe would help increase the propulsion capabilities as well as payload modularity. We would really like for the Mk-48 in future to have modular payloads,” he said.